Join the #TargetBacktoSchool Twitter Party! Do you remember your first day of school? My memories are faded and seem almost dream-like. I can’t recall my first day of school, but I do remember bits and pieces of being in junior kindergarten. I remember sitting in a circle singing songs and colouring and doing my very best to stay inside the lines. I was a very shy, sensitive little girl and my teacher wrote on my report card that, “Stacie tends to cry very easily”. Today, I’m much stronger, but still sensitive and shy until you get to know me. I guess not much has changed there! I’m anticipating this back-to-school season to be a hectic one. Both girls will be starting a new school. Olivia is going into grade 11 at the high school I went to and Bridget is going into grade 5. They grow up so fast! It’s hard to believe that Olivia only has two more years of high school left before she goes away for her post-secondary education. Time sure flies. I’ve started some of the back-to-school preparations already. Olivia and I have an appointment in August to talk to the guidance counselor at her new school to select her courses. I also have to find out what school supplies they’ll both be required to have at their new schools. Then I need to find out where each of their bus stops are since we don’t live in walking distance to either school. I also need to do the actual shopping- buying all the school supplies and school clothes for the upcoming year. My to-do list is getting long! My back-to-school tip is starting getting prepared now. Don’t leave everything to the night before. I’ve done that once before and never again! It’s way too stressful. 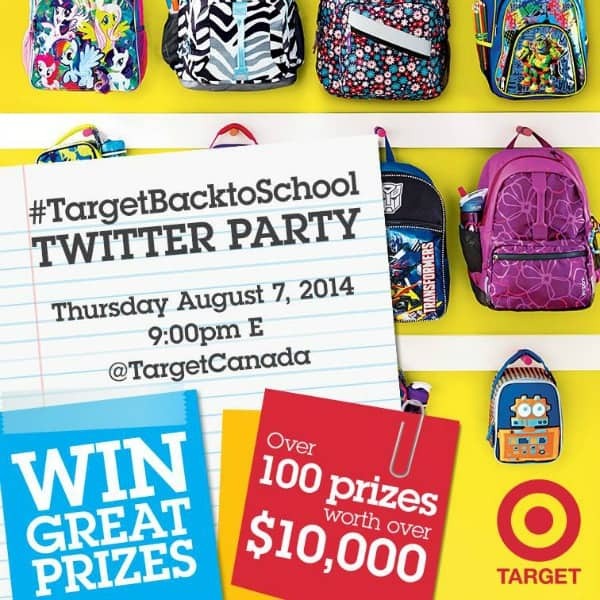 Target Canada is hosting a back-to-school Twitter party to help you get prepared for the upcoming season. In addition to all the great tips, you’ll also have a chance to win back-to-school supplies with many available exclusively at Target Canada. I’m talking over 100 prizes with a total value of over $10,000. Yes, you read that right. Over $10,000 in prizes will be given away at this Twitter party. This is one party that you DO NOT want to miss! Platform: Follow along on TWUBS or your preferred platform. Please RSVP to be eligible to win all the fabulous prizes! woohoo! I am looking so forward to this one! Olivia and Bridget are such incredibly beautiful names 🙂 I vaguely remember pieces of what it was like to start school, but that’s REALLY going back a million years and I can barely remember what I did over the weekend 🙂 LOL, like you I was also shy/quiet and it took a while for me to warm up to my peers. So crazy that it’s almost August! Where has the time gone?? I am excited for the party but not for back-to-school…yet!